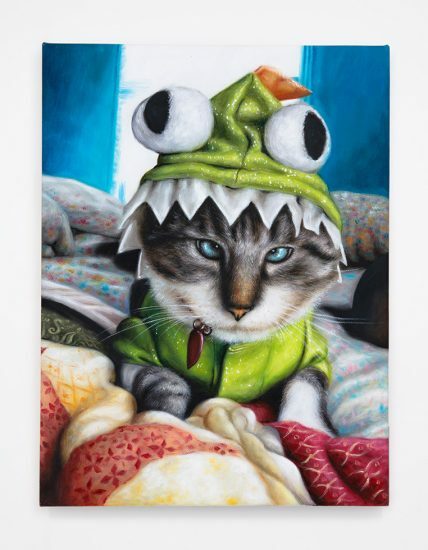 “With ‘Cats in Costume’ I wanted to work on a project that was colorful and pertinent, but also absurd. Inspired by the popularity of cats wearing costumes online, it occurred to me that there was something to be said about why these images are so popular. Cats have become symbols of the internet itself—wild, playful, chaotic—and also a major source of cultural obsession, a phenomenon that was explored at length by the Museum of the Moving Image in New York in its 2015 exhibition titled ‘How Cats Took Over the Internet.’ Around that time I started to notice a shift in our collective feline fascination, during this new era of cultural change and political uncertainty. Even though we have always enjoyed sharing memes and viral videos of cats doing wacky things, today we may no longer find them as comforting. As part of an ongoing shift in consciousness, I have seen an increase in the popularity of internet cats acting like dogs (cats are not, for example, so easily dressed up in costumes). Perhaps by sharing images of cats whose behavior reminds us of trained puppies, we can be reassured that we are capable of restoring order to our lives, which at times can feel swept away by fast-changing technologies and by the sense that we are all interconnected in a world that might appear beyond our control. “I was also thinking about the lifespan of online content, particularly of these nonsensical images. When someone takes a silly picture, posts it online or shares it with friends, these images are subsequently (re)shared and (re)posted; some becoming viral, others totally forgotten. What if I took such images and hired a painter to turn them into oil paintings, one of art’s most traditional mediums? Would these physical objects outlive their digital counterparts?